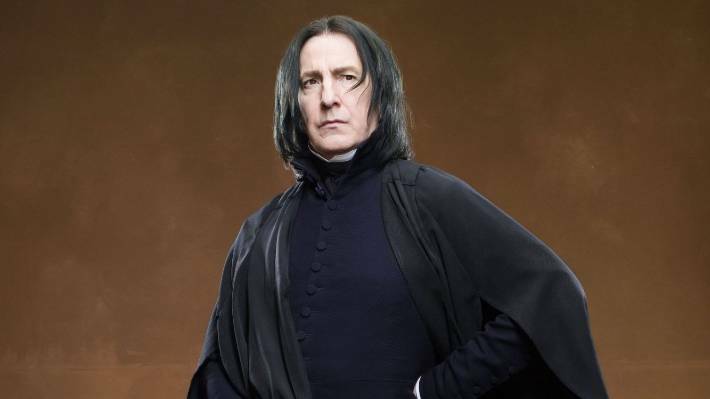 You know Professor Snape from Harry Potter, right? 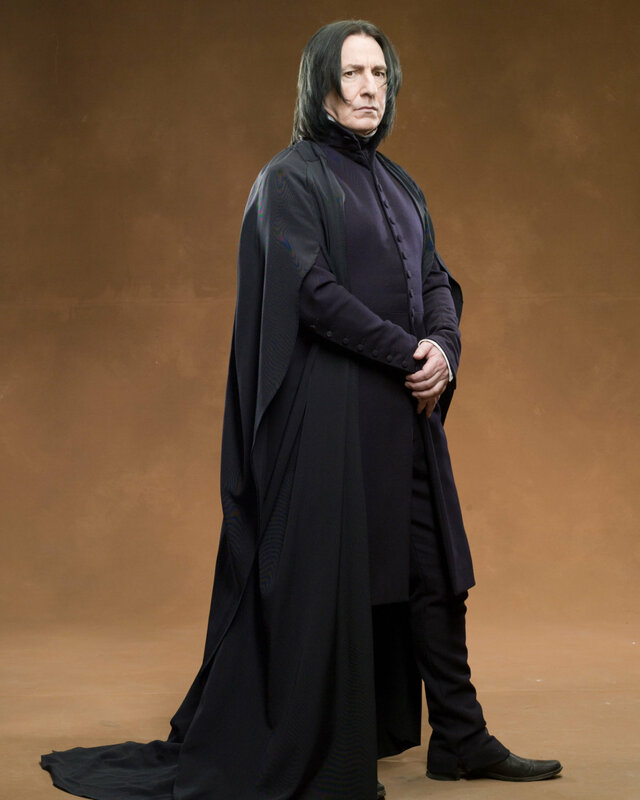 He’s always dressed in black, right? 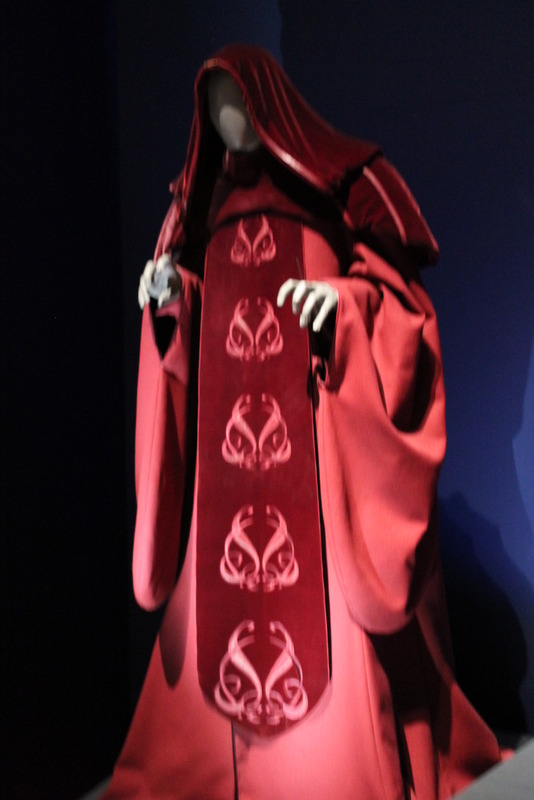 However, if someone wanted to make a correct replica of his robes, he’d have to make them blue. You might be wondering if I got colorblind or such, lately. 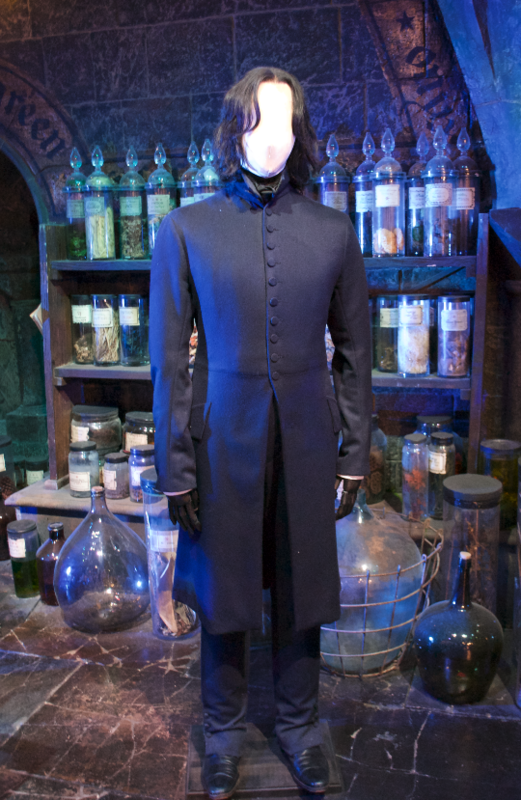 But the fact remains: the original costumes worn by Alan Rickman are blue. 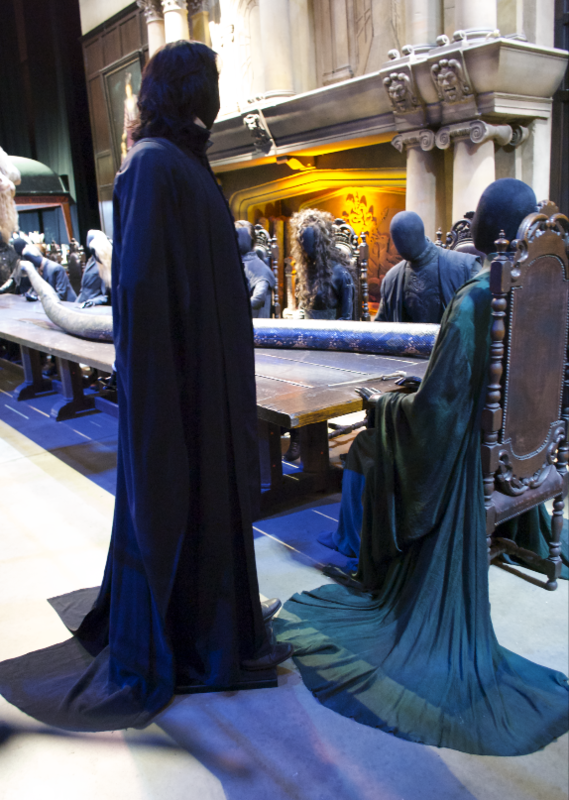 And if you want to make yours as close as possible to the real thing used to make the movies, your fabric needs to be…blue. This is one of the fun facts you learn about, when you visit the Studios. 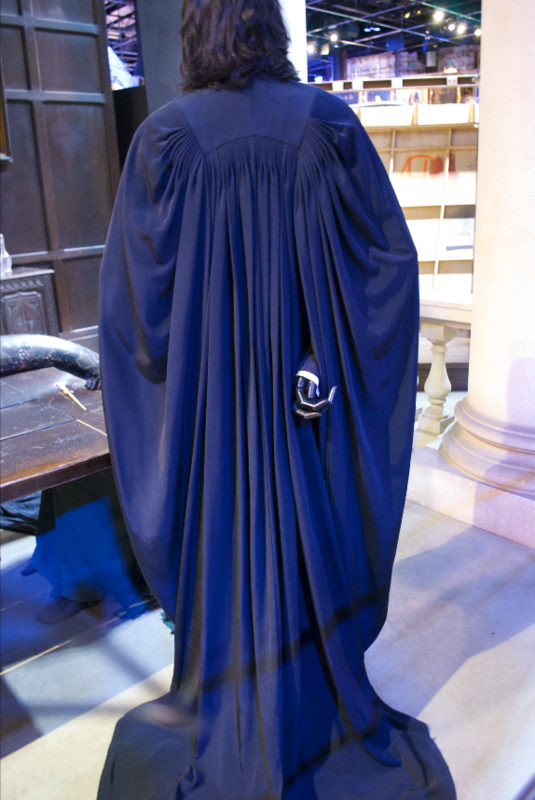 They had to make the robes blue, because black on screen didn’t look right. 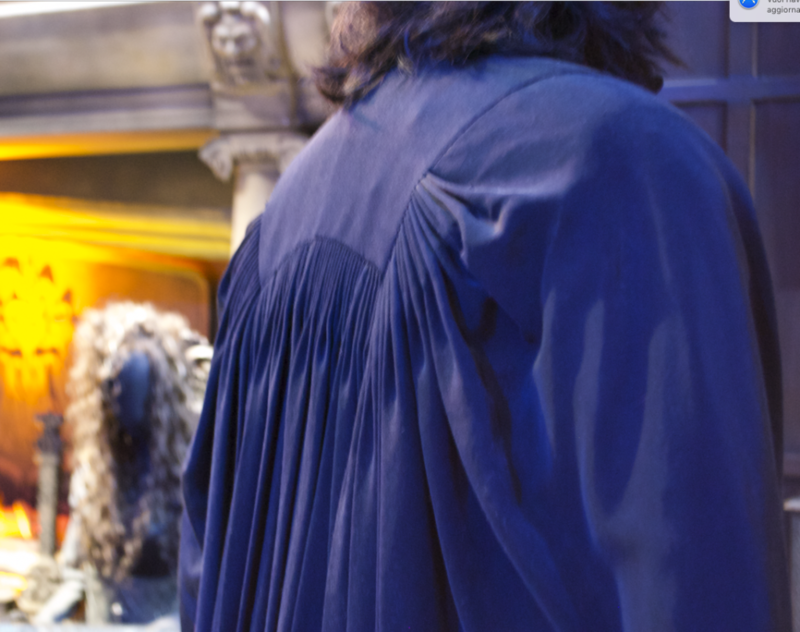 His robes look blue in some promo pics too. 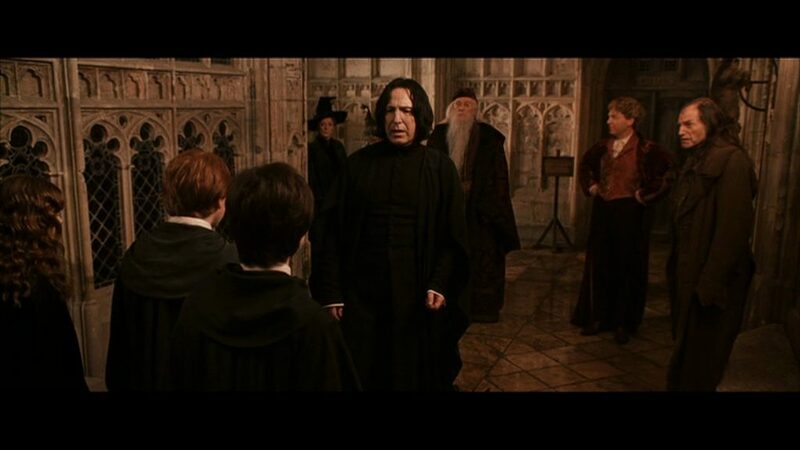 But on screen, they always look very very black. It’s written in the books: he only wears black. 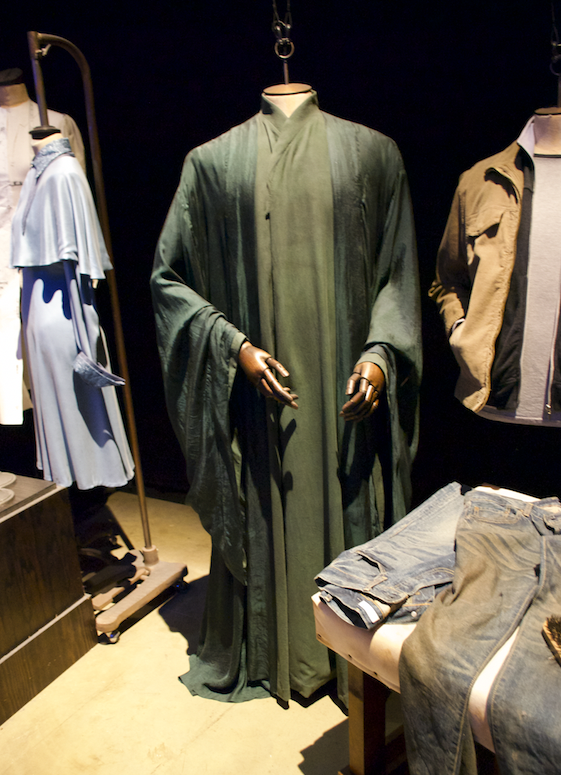 I just love his professor robe from the last movies. In the first ones it was ok, but the new one made him look like a crow, with a tail and wings sleeves, and it was awesome. 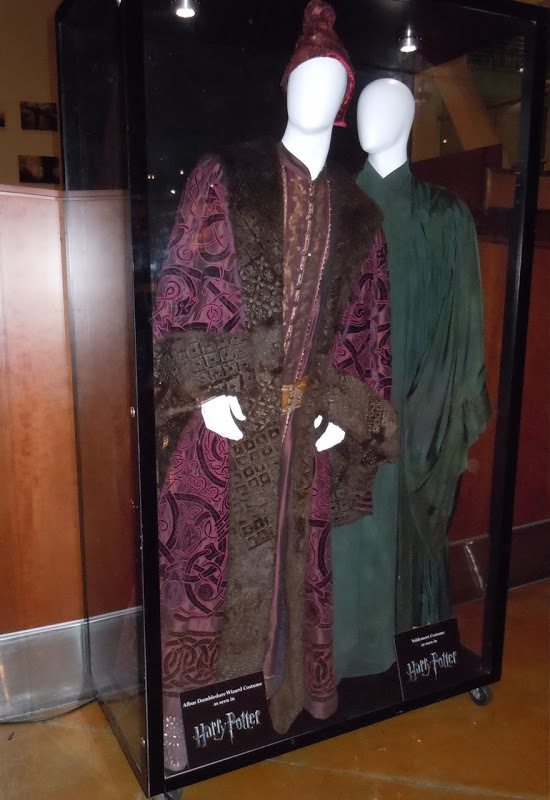 Here you can see some pictures of both costumes, and some I shot from the studios. The colour difference from blue and black is subtle, I think some elements were actually black. 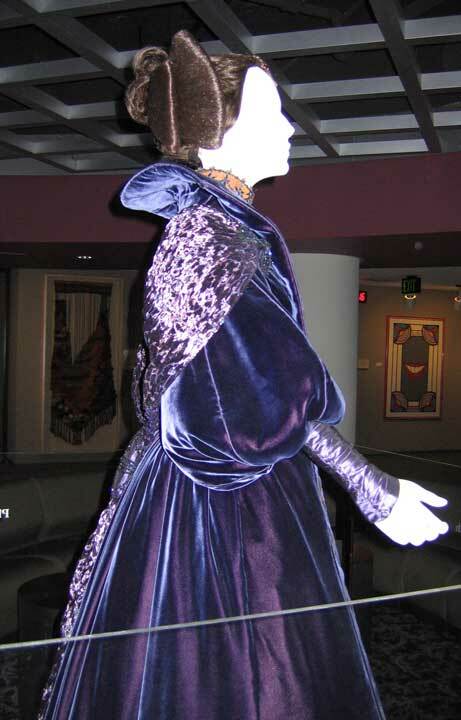 And even in the exhibits you can see the costumes with coloured light, in this case mostly blue. In person it’s much easier to see the difference, but from pictures, it’s quite hard to tell. 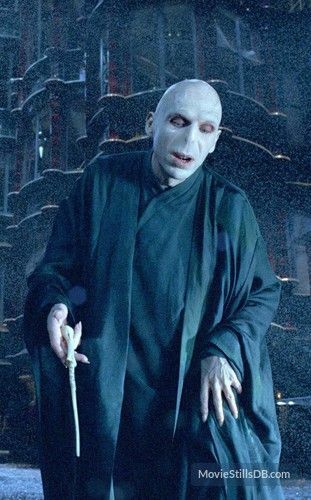 Fifty shades of green for Voldemort. 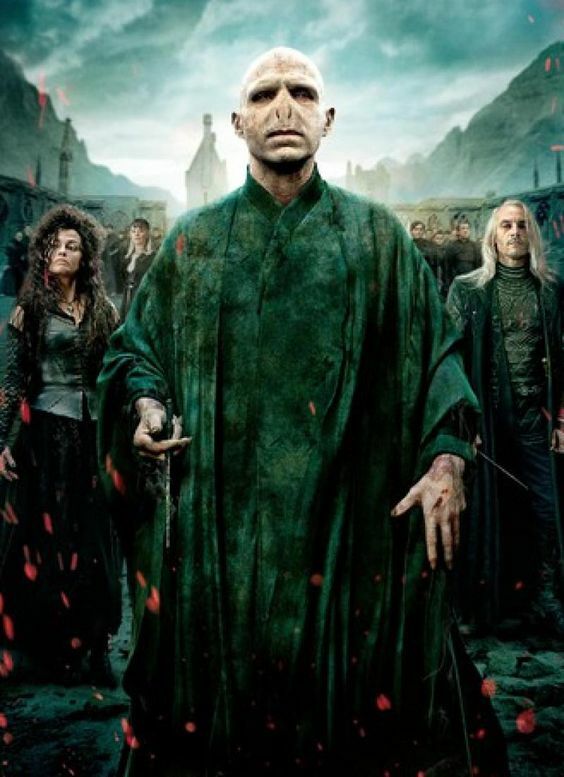 Voldemort is for sure dressed in very dark green, almost black. Right? 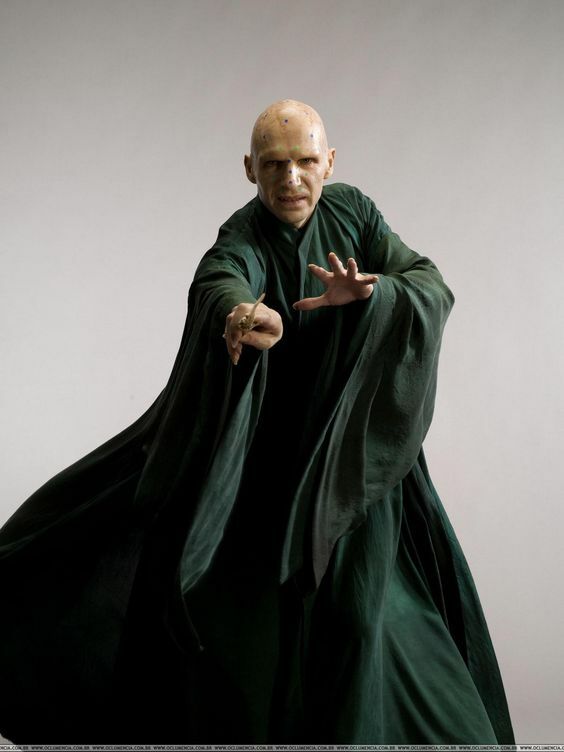 But how many Voldemort costumes were made? At the Studios there are at least four. 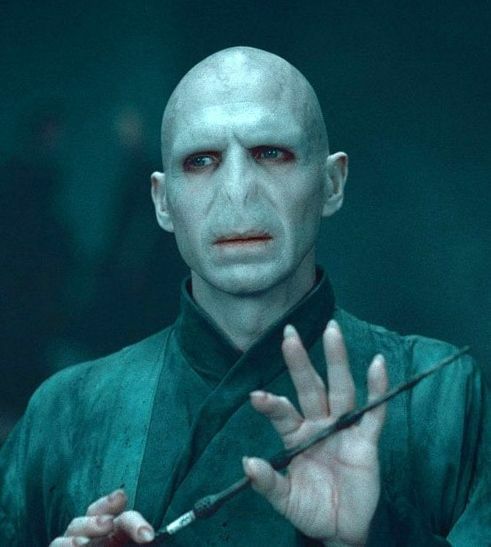 And our Dark Lord goes from dark green to pastels. 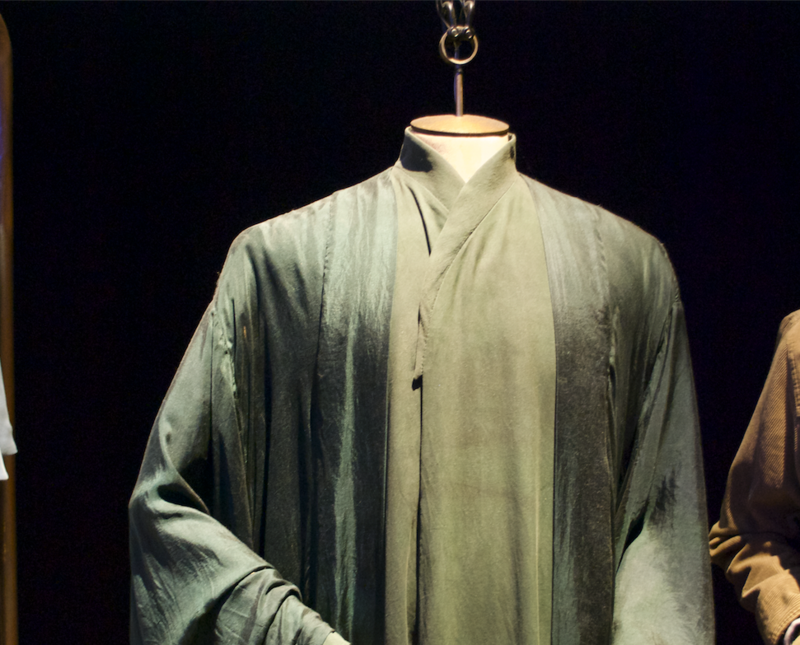 Really, there are copies of his robes that are pastel green. 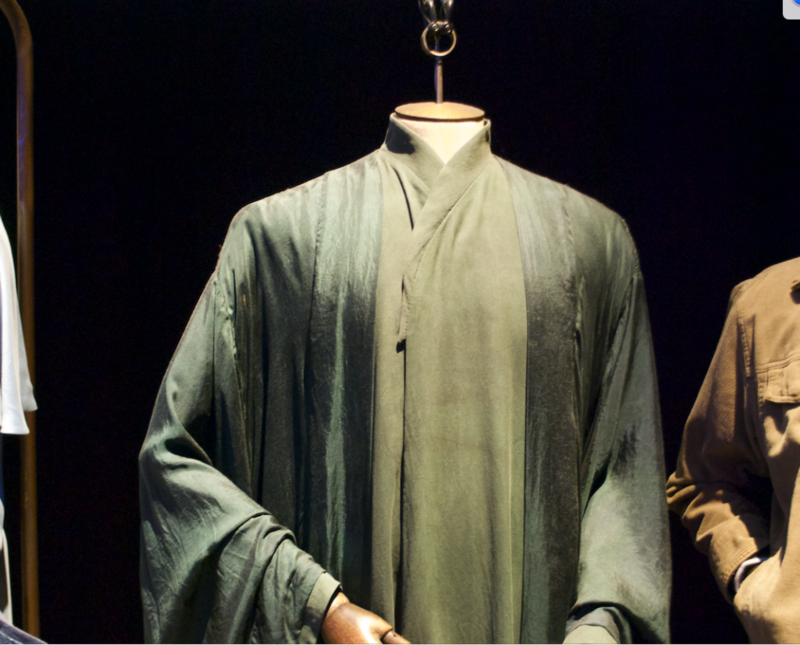 A masterful dyeing and weathering work makes the colours vibrate. Some of them are ombré, lighter at the top. 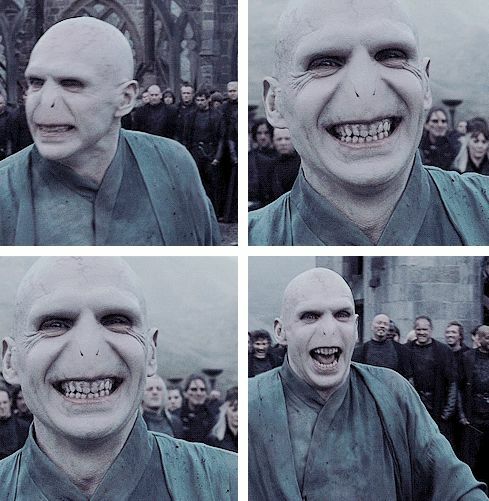 But if you wanted to make a Voldemort costume replica, which colour should it be? I personally opted for one of the ombré versions, but I started with a lighter one, and no one knew what that costume was, except me. Quite frustrating. Some of the pictures are taken from the Studios, once again by myself. But there are others, from other exhibits, found online, that show an even wider range of shades and textures. 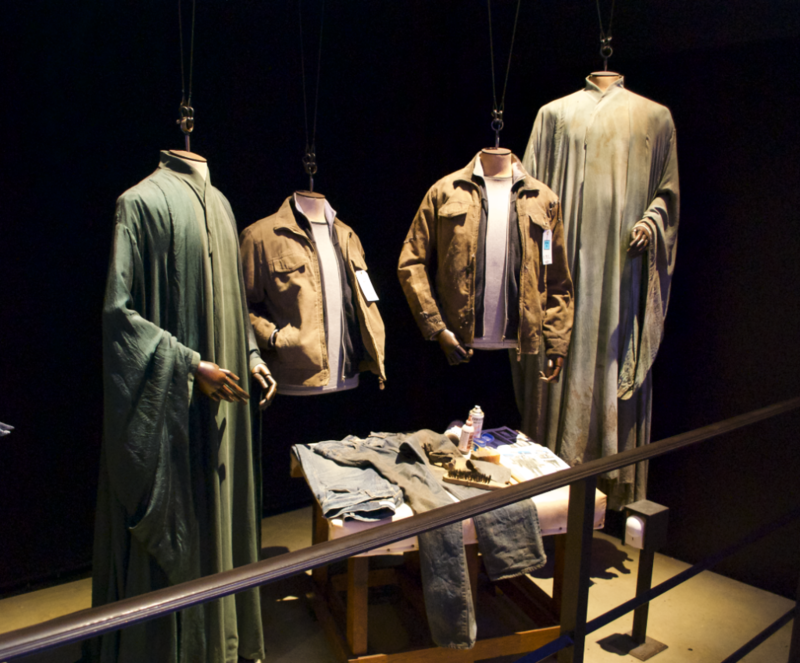 And an even wider number of costumes. An other example? 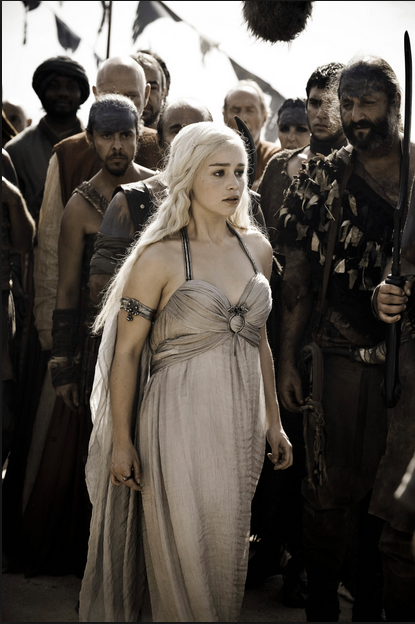 The beige wedding gown Daenerys wears. In the series it’s metallic beige. 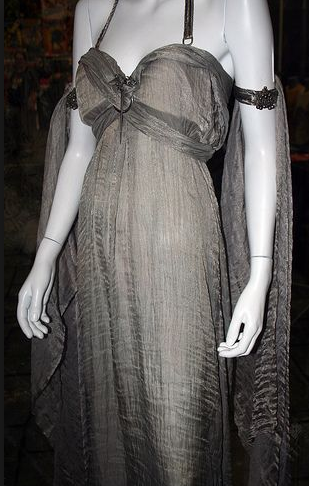 At the exhibits, the dress is silver. 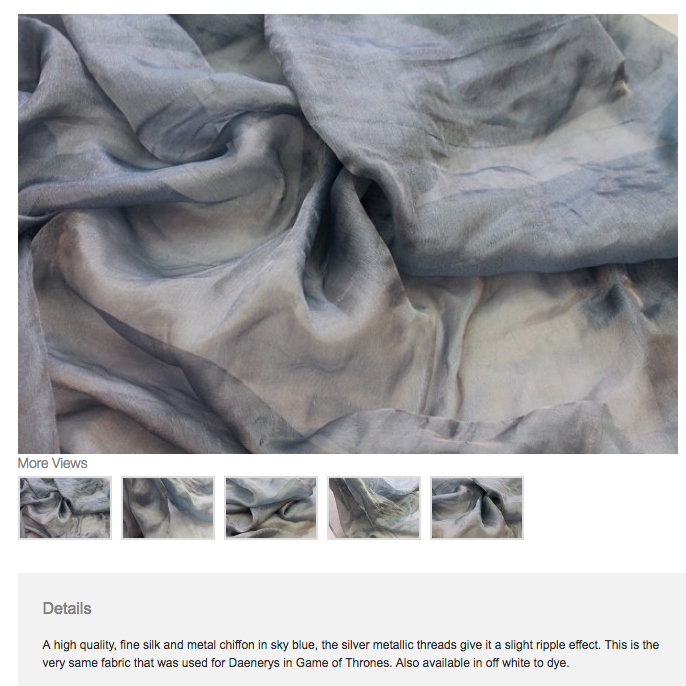 When you visit the website of the shop that sold the original fabric to the production, they assure you the original dress was made out a pale grey-ish blue fabric. You can see it in the screenshot below. But in the end, if you get out with a silvery blue dress, everyone starts telling you that you made your dress wrong. But you really made it as close as possible to the original. 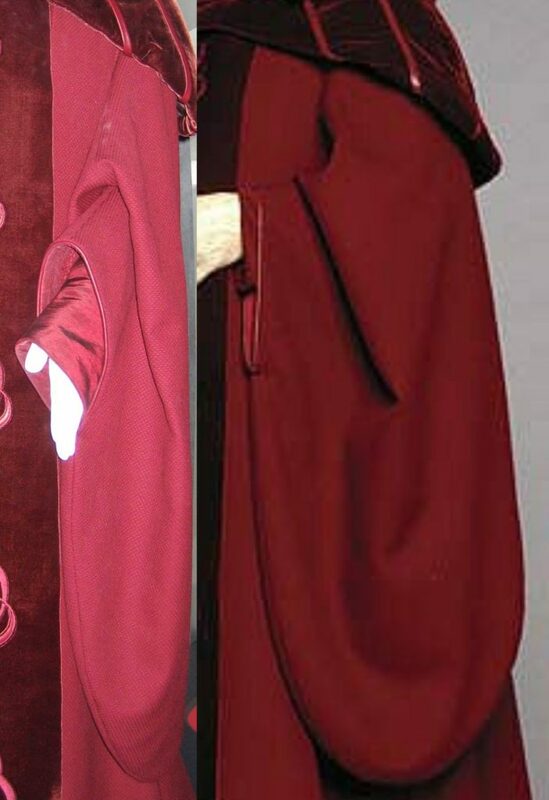 Palpatine's red robes. Red. Which red? And I have more! 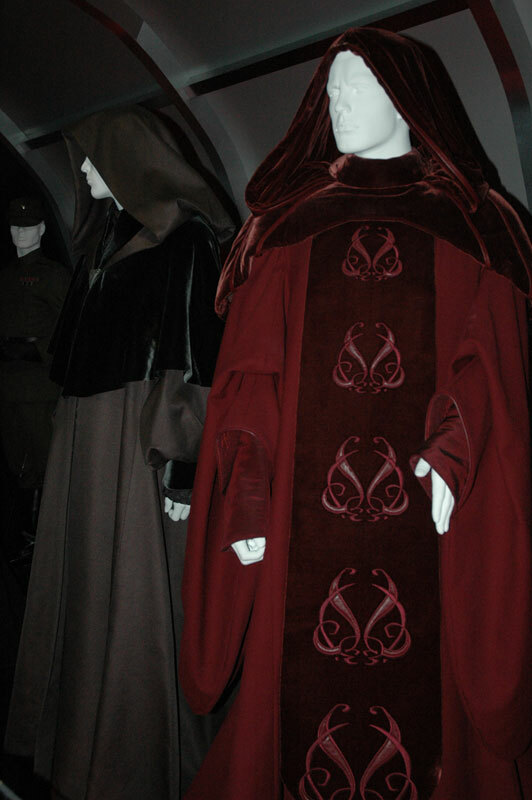 Palpatine’s red robes. 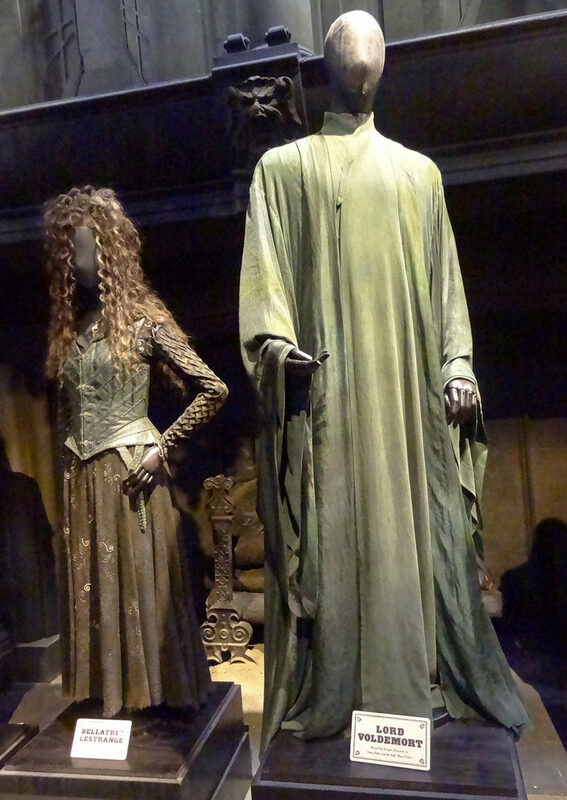 In the movie there’s a very low light, as in most exhibits and in the fashion show, when it comes to this costume. 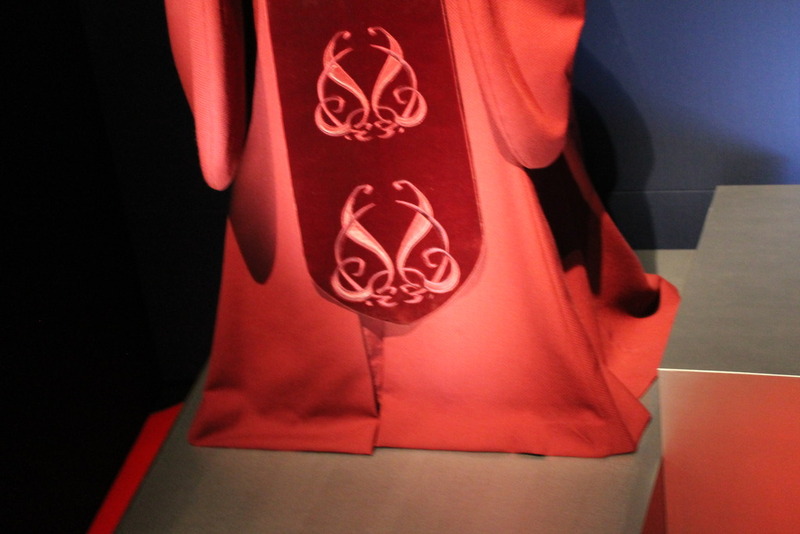 Under a flash, the fabric of the main robe becomes very light. And here we’re talking about the very same costume in the following pictures, not the many made for Voldemort. We also have to consider that red is one of the hardest colours not to alter when taking pictures. And one of the hardest to get under lights or on stage. 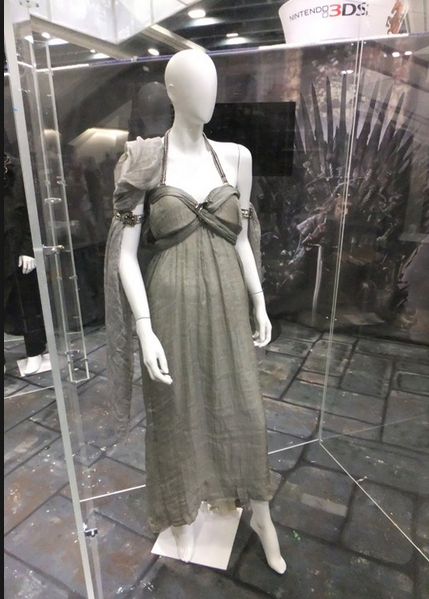 Some of these pictures come from Naergilien’s costuming site, which is a very valuable resource, and something I always have a look at, before making a costume she has already studied. Others from Padawan’s guide, others from friends in 501st. 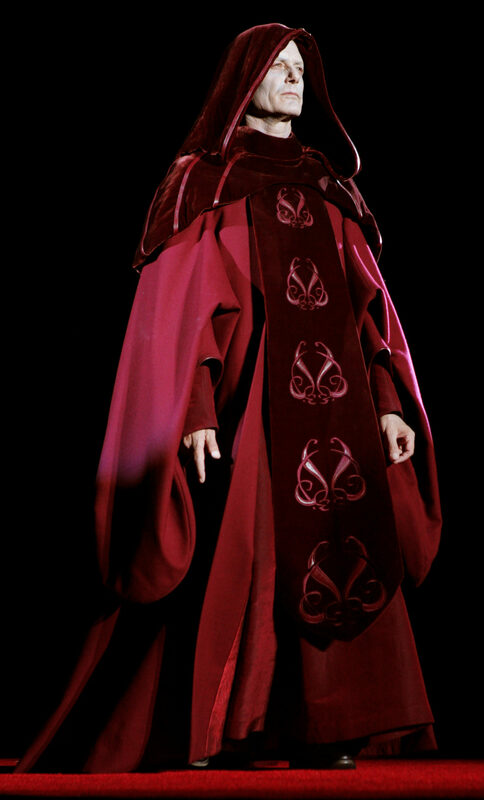 And because I just can’t avoid talking about Padmé, let’s talk about the velvet in her cut scene teagown. Blue from promo pics, purple in real life. And yes, let’s remember that in the senate room it looked black and yellow. 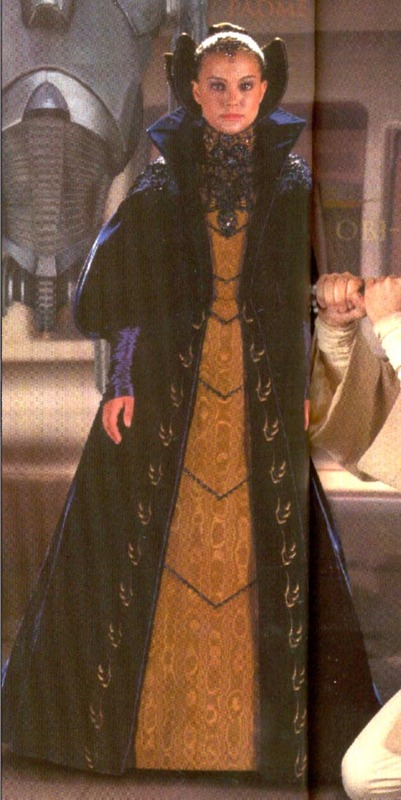 Or her episode III nightgown. The one that looks lavender on screen. The real one is a mix of grey and blue. This is why I always wait to see some pictures of the real thing, under real lights, to start working on something. 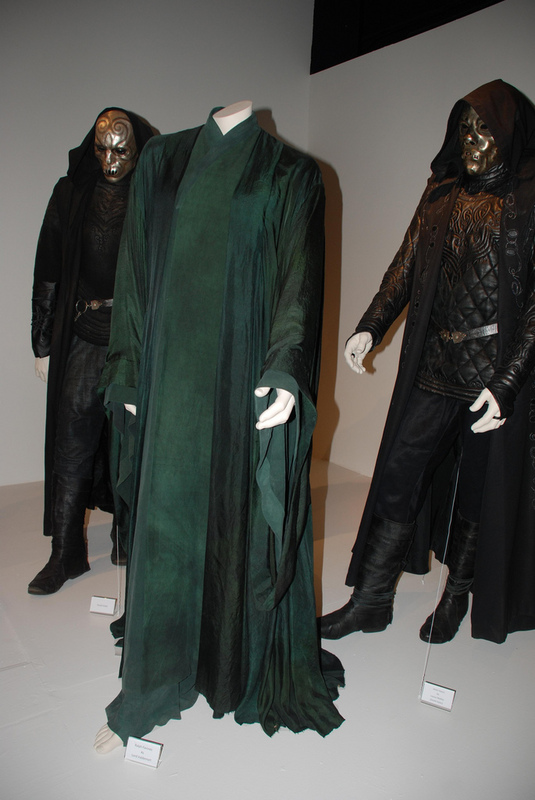 First of all, you have to consider a costume like the actor’s working attire. 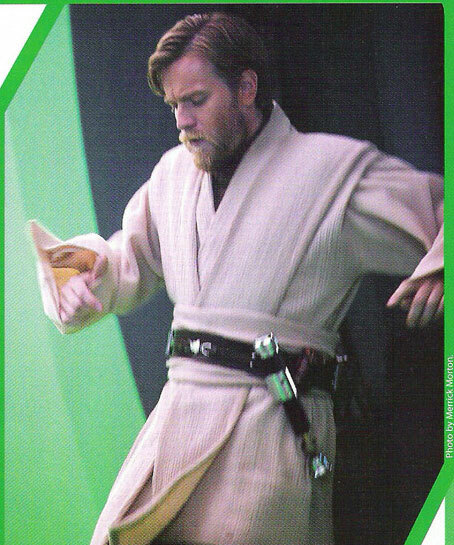 You see two hours of movie, but he had to wear the same costume for months of filming. 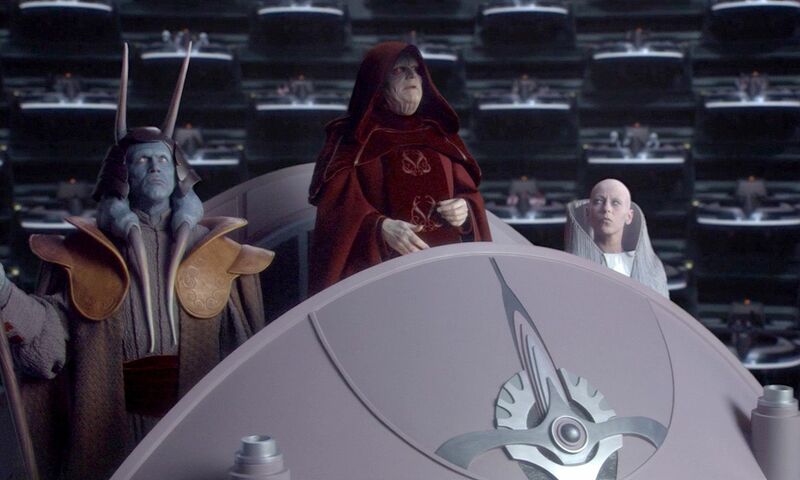 Let’s take Anakin and Obi Wan from Revenge of the Sith. They never change. Very same costume, always. 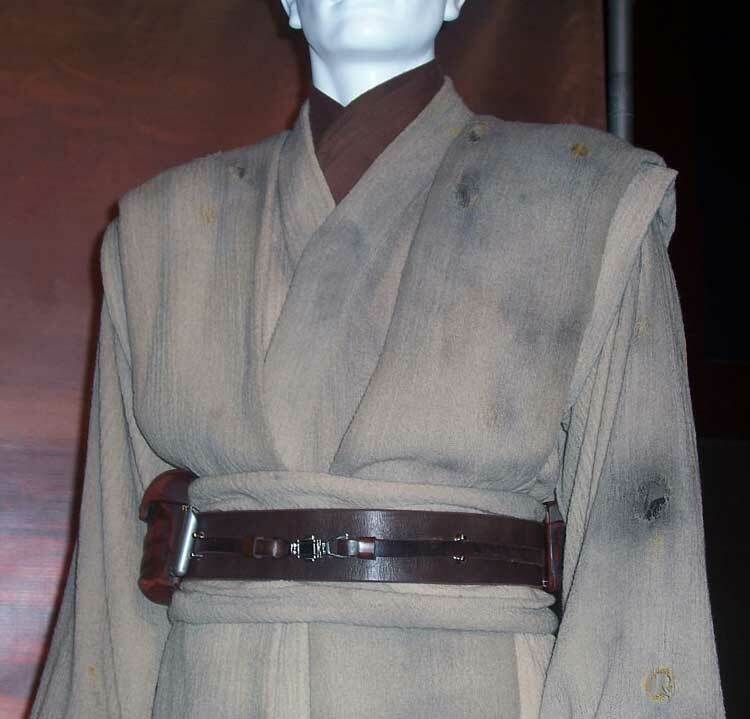 Was Hayden Christensen supposed to wear the same robe for four months, daily? Thank god no. 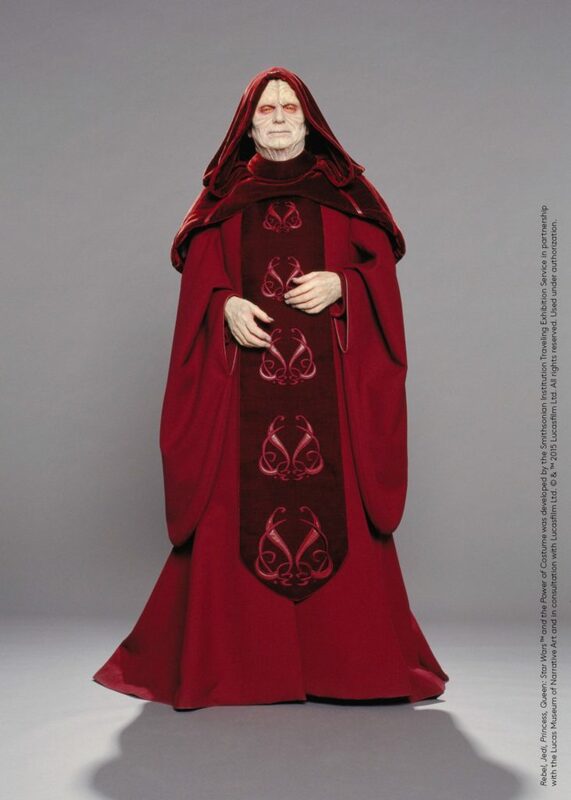 In some cases, they don’t make many replicas of most complex costumes, but when it’s like this, they do! They make copies for stunts too. 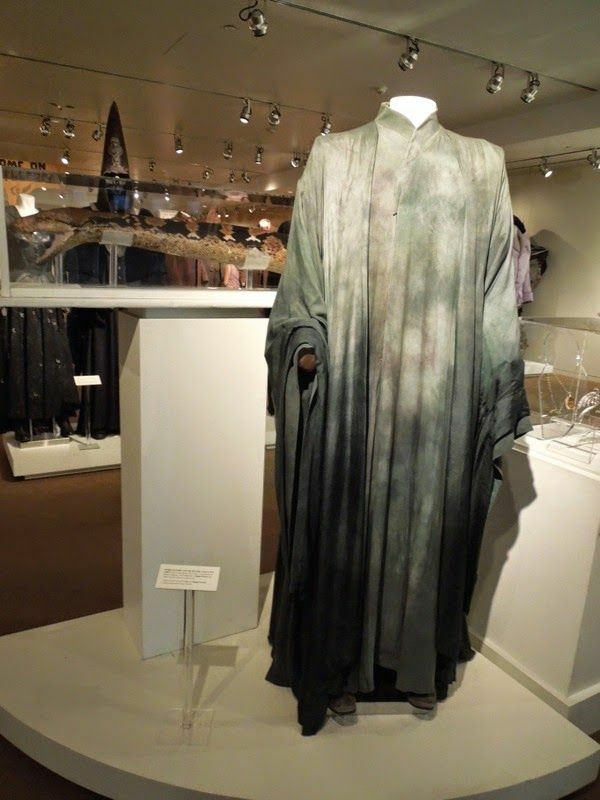 If a costume gets dirty or old in the story, a new copy is made and distressed differently. 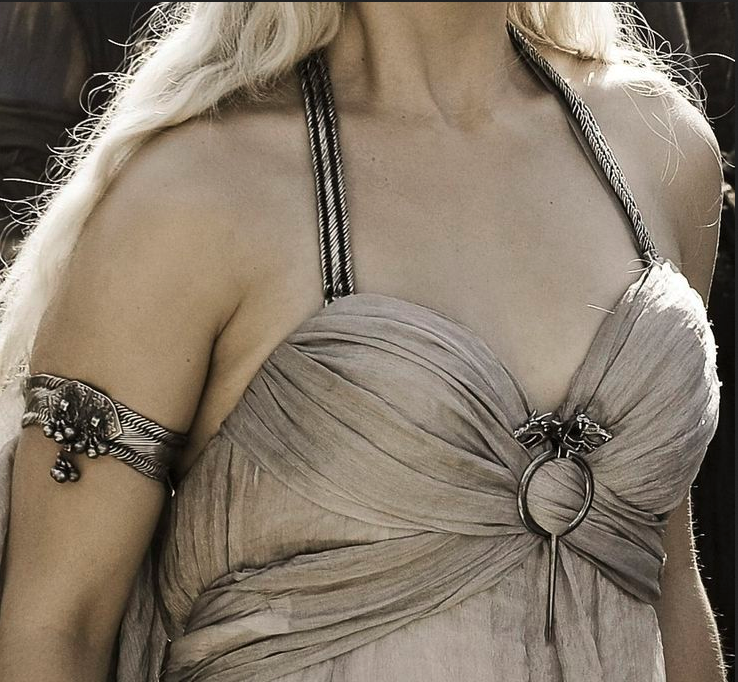 Just imagine having a single dress that needs to get older. You force all the production to film to distress it a bit every day? 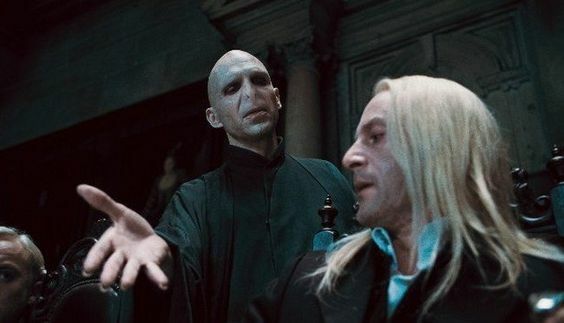 And what if they need to remake some scene? To solve this problem they make copies. Each for every distressing stage. See a character getting dirty in a swamp? Someone burnt by fire? Someone lost in the desert for days? Someone needing a stunt? Copies, copies, copies. 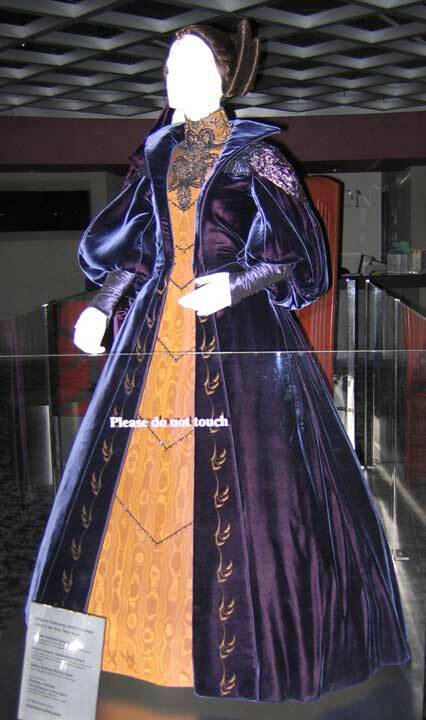 And sometimes they even make copies for exhibits, without showing the actual costume. 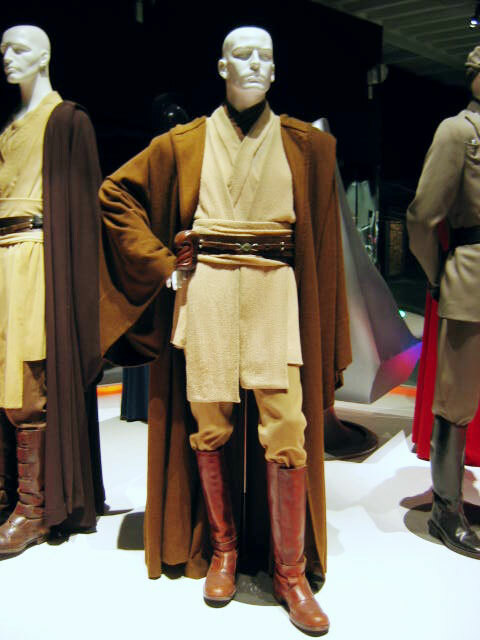 In Dressing a Galaxy they say they made more than fifteen complete outfits for each main jedi character of every episode of the prequel trilogy. 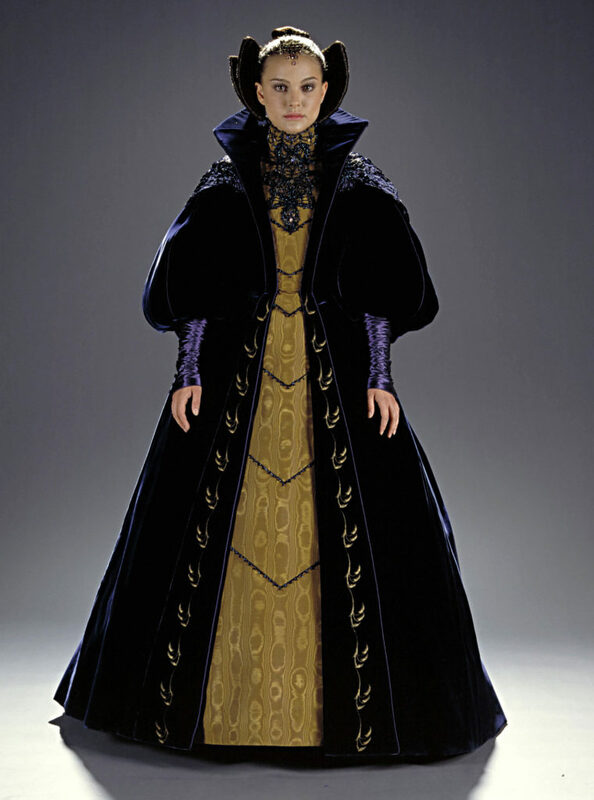 The costume has also to look the same under different light situations. 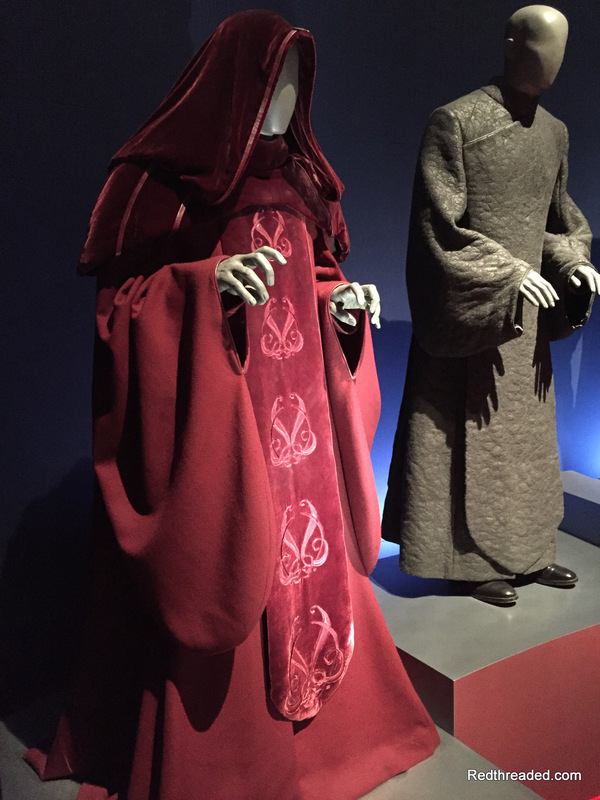 In low light, you need to see details of dark costumes. Which means sometimes a lighter version is made. 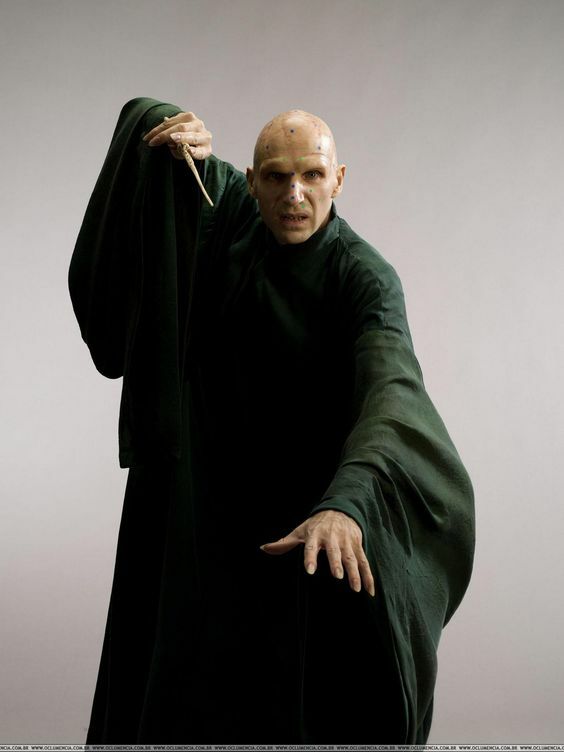 Which I guess was the case of the pastel green Voldemort costume. Then there are filters. 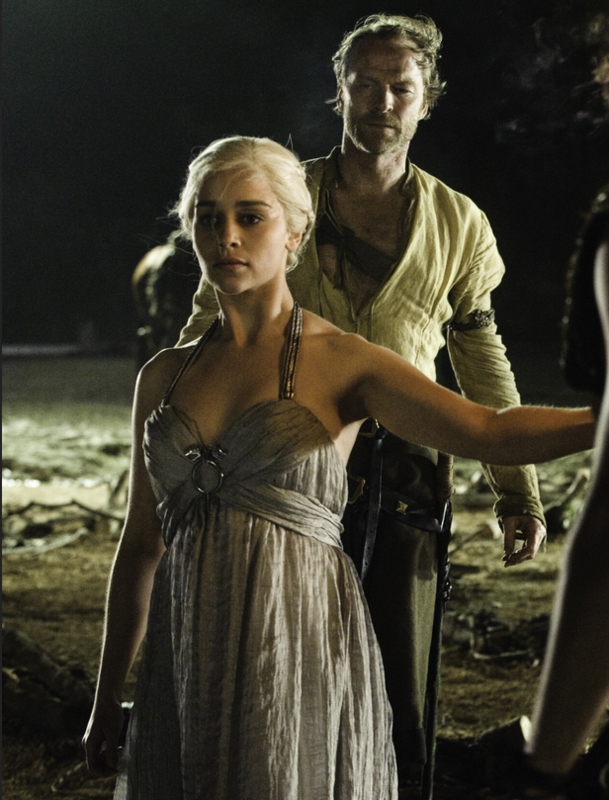 Game of Thrones is famous for its infamous beige filter that makes all costumes look different than the real samples. 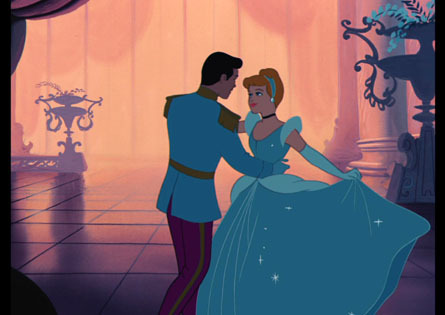 Consider also that for the Cinderella live action several ballgowns were made. Some for the still parts, some to ease dancing and such. 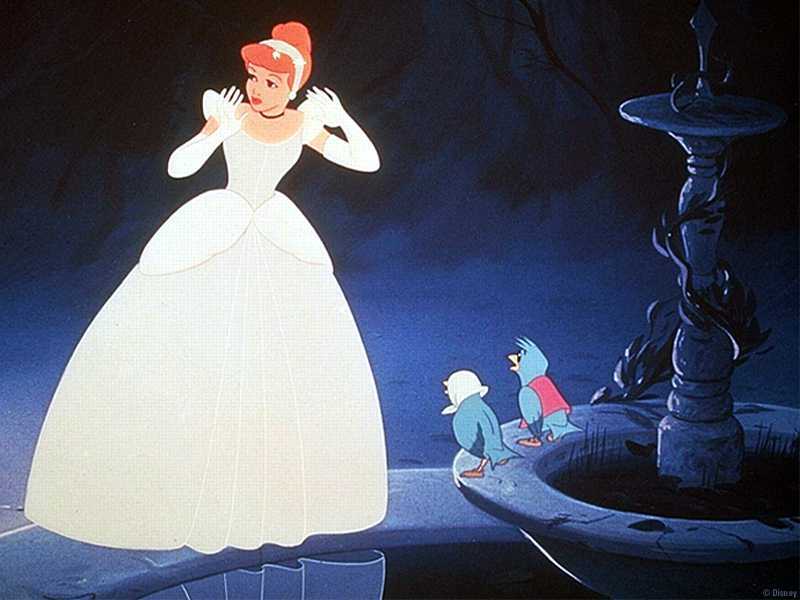 Even in the cartoon Cinderella has a silver ballgown. At least it’s silverish white when it’s already dark and the Fairy Godmother makes it appear, and it’s blue at the party. 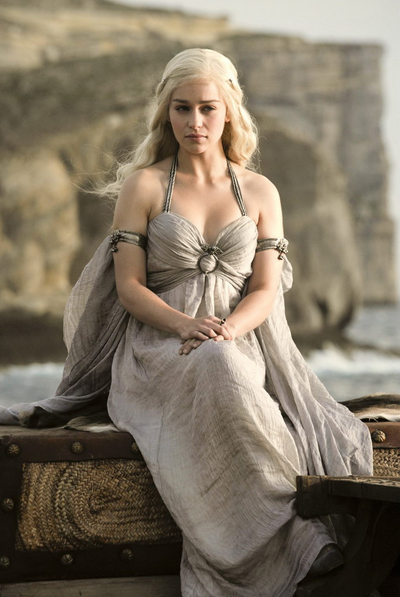 It’s always dark in there, even when it’s white, and everyone makes it blue, because if you make it white, they ask you what’s your character, even with a flawless dress. 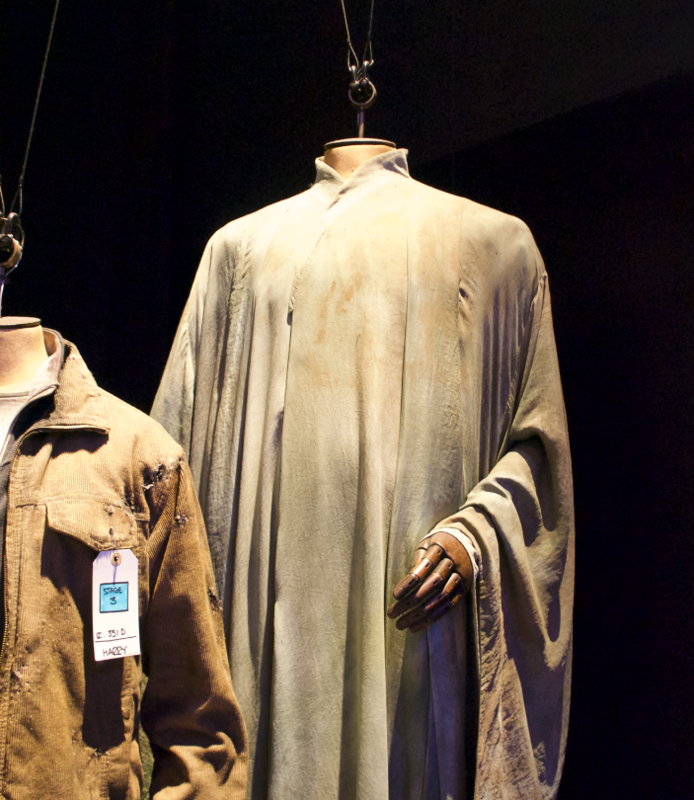 When you choose to make a costume you’ve seen in a movie, it’s better to know all of this. Because what you see on the screen is not always as the real dress looks. So…in the end, what should you do? First? Never make a costume when the trailer comes out, if you want it accurate. Wait for behind the scenes, promo pics, and exhibits. There is no truth. For what concerns my work, I like to get as close as the original object. 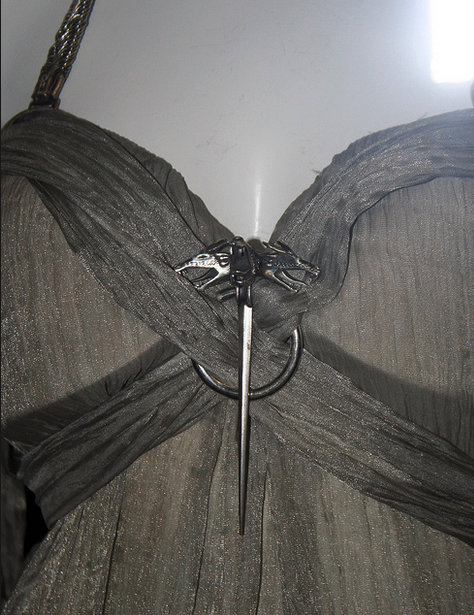 This is part of the difference between a replica and a mere costume for cosplay. If you want to look the same as seen on screen, do the things as seen on screen. It’s perfectly fine to me. 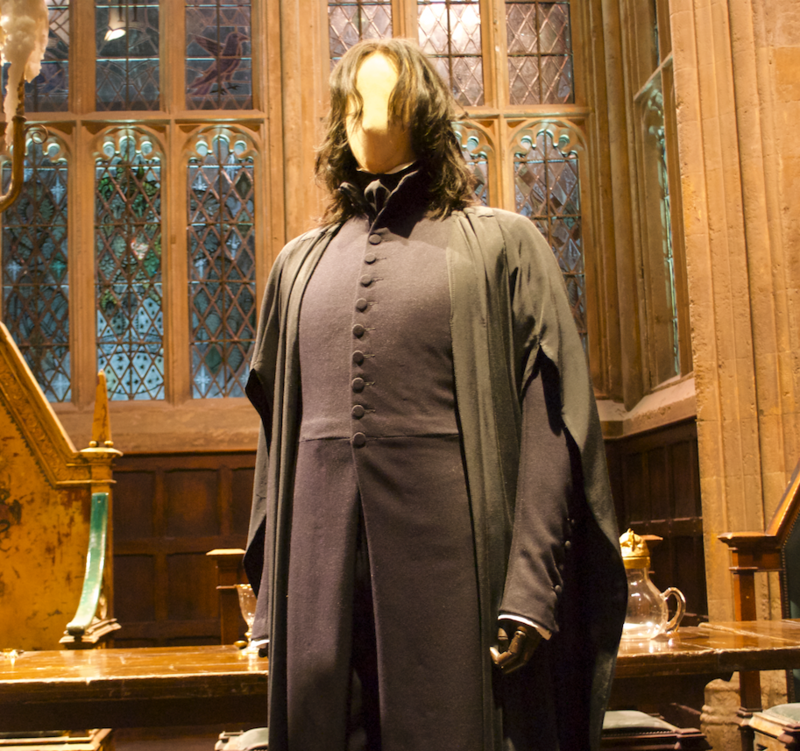 Just please…study the costume before telling someone he’s been doing things wrong. And respect other people’s choices about their own costumes. This is a very interesting phenomenon, and a tricky subject when it comes to ‘accuracy’. 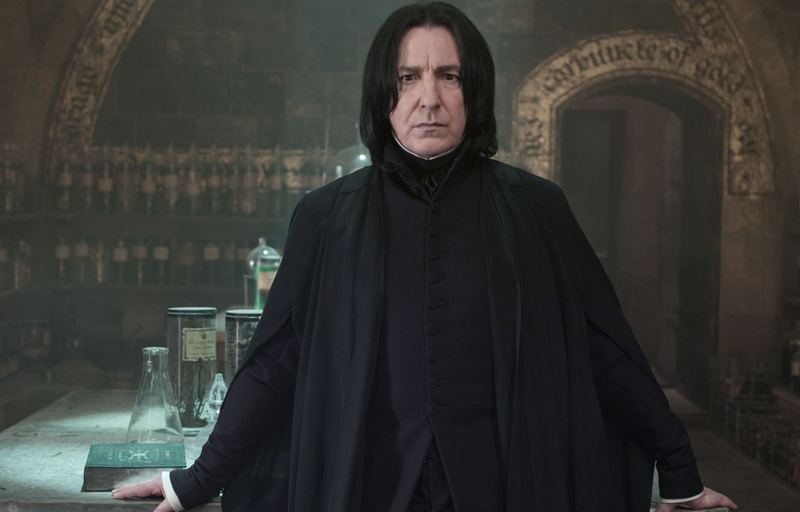 I imagine the costume departments will occasionally purposefully make a garment a different colour than what the character is described as wearing, because they know the lighting on set and editing filters will alter the colour. When recreating a specific characters outfit, the question is then do you create it as it was meant to be viewed, or as it was constructed? Like you say, there is no one truth here, and ‘accurate’ can mean very different things depending on the context, when it comes to screen costumes. 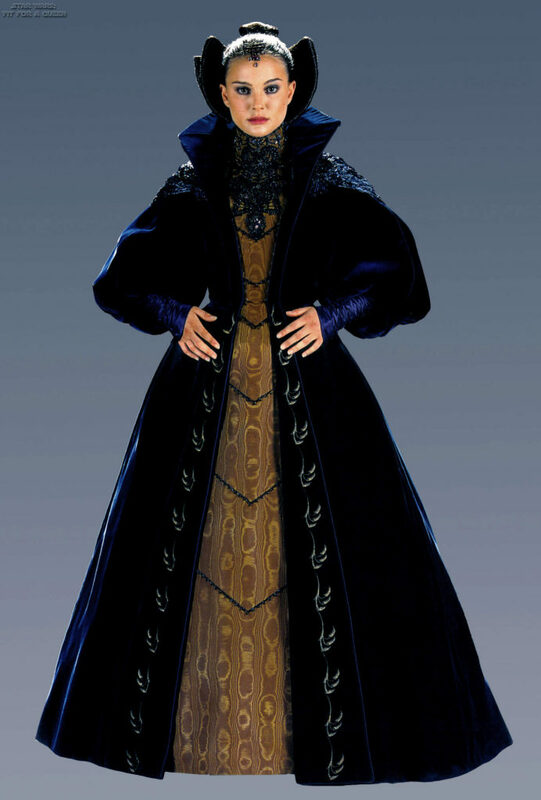 Personally I would probably opt for constructing the garment as much the same way the original costumer did, but choose my colours based on the intended colours. Thank you for writing this, and showing the differences side by side, it is very interesting!